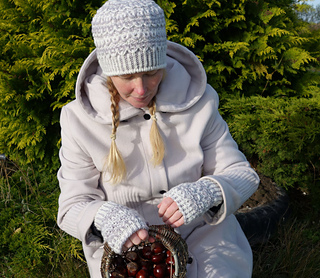 A mittens and fingerless gloves pattern is also available - if you buy one pattern, you will get get a discount for the other, and you don’t need to put them in your basket at the same time, past purchase will count. Difficulty: Medium. 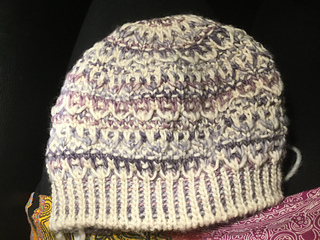 Two colour Italian cast on is used, and the edge of the hat is worked in two colour double knitting. 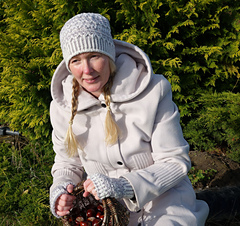 However, after the (in fact quite simple) cast on is done, each row is worked with one yarn at a time only, and so the double knitting is just knit or purl with slipped stitches between. Needles: US 8 (5 mm) circular needle (16 inches / 40 cm), or size to obtain gauge. Double pointed needles in the same size for the crown, or use a long circular needle and magic loop. Yarn: Zitron Luv & Lee, 100 % merino, 109 yards or 100 m/50 g, two contrasting colours, 50g in each colour. Colour 300 (white) and 301 (grey) was used here. Gauge: To get the proper fit, make sure you have correct gauge. Treat your gauge swatch the way you want to treat the finished hat (hand wash/machine wash) and allow it to dry completely before measuring. Gauge is 18 sts to 4 inches (10 cm) in stockinette stitch. The two colour corrugated rib is 20 sts to 4 inches (10 cm). The body pattern is 19 sts to 4 inches (10 cm) and 10 rows to 1 inch (2.5 cm). Go up or down in needle size to obtain gauge. Sizes and fit: As written to fit heads size adult M (L) 20.5 (22) inches or 52 (56) cm. Shown here in the first picture in the smallest size on a size 20.5 inches (52 cm) head. The hat measures (unstretched) 19 (20.5) inches or 48 (52) cm around the rib, designed with a minimum of 1.5 inches (4 cm) of negative ease. If you want a tighter fit, go down a size. If you are between sizes, work the smaller size. From cast on to bind off the hat measures 8 ¼ inches or 21 cm in both sizes. Size can be modified to fit. 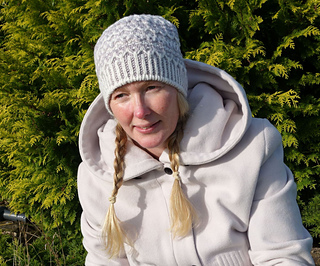 The hat is quite stretchy and the smaller size may fit heads all the way up to 22 inches (56 cm). 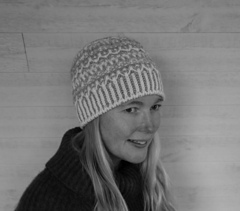 Changing size and yarn: You can work practically any size hat with this pattern, at any gauge. Instructions are included. If substituting yarn, you will need yarn with a lot of body. A single almost unspun wool like the recommended yarn is perfect. Abbreviations used: k – knit, p – purl, wyif – with yarn in front, wyib – with yarn in back, tog – together, yo – yarn over, st – stitch, sts - stitches.